Alliteratively named Robotic Process Automation (RPA) player Automation Anywhere has opened its bot store to developers. Touting the availability of cognitive IQ bot technologies, the ‘let’s use a double-A moniker to be first in alphabetic lists’ firm has promised pre-trained cognitive bots that bring structure to unstructured data for complex business processes like financial statements, purchase orders and invoices. The cheekily named ‘Bot Store’ features off-the-shelf plug-n-play bots. Its operators say that the most popular bot category is Artificial Intelligence (AI) with 24 bots — the speech-to-text bot leads the way in downloads. The most common business process is finance and accounting, with the “allocate payments against outstanding invoices” the most visited bot. SAP is the most prevalent application with 31 bots listed. Abhijit Kakhandiki is senior VP of products and engineering at Automation Anywhere. Insisting that his firm’s offering has value, Kakhandiki says that until now, partners and developers offered bots that either automate repetitive business processes or provide API integrations with leading enterprise applications and AI platforms using the Automation Anywhere Enterprise RPA platform. “With the addition of Automation Anywhere IQ Bot, developers and partners can now offer native computer vision, natural language processing, and machine learning capabilities. Several partners and developers have already contributed pre-trained, cognitive bots to automate document-centric processes. Examples of IQ Bot-enabled processes in the Bot Store include those that can automate utility bills, bank statements, standard settlement instructions, explanation of benefits, 1040 forms and W4 forms,” said the company, in a press statement. 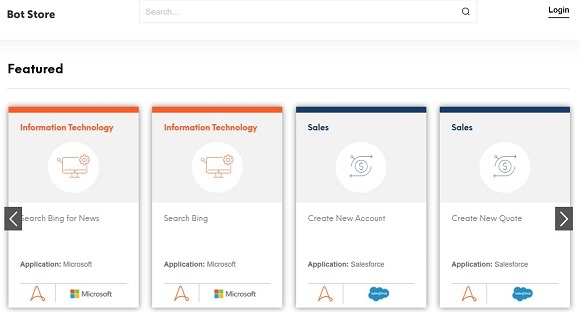 The bots in the Automation Anywhere Bot Store run on the Automation Anywhere Enterprise platform and can be snapped together like Lego blocks to automate complex business processes.